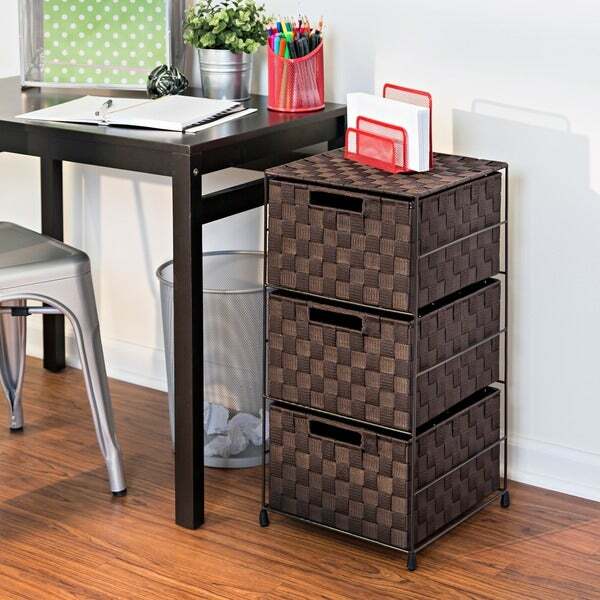 I like this product because have multi use for it such as putting CDs, clothes, or bills. I also like because it is small and can fit in any corner of my bedroom. I would recommend to a friend or family member. Honey-Can-Do OFC-03714 3-Drawer Chest, Espresso. Getting organized has never looked better with this impressive double woven chest. This storage unit has three spacious drawers with handles to hold clothes, tools, office supplies or anything else that needs tucked away. A soft top surface provides even more storage space and can double as a night stand. Coordinates with other pieces in Honey-Can-Do's collection of double woven products. I like this cart but mine didn't come with wheels. Maybe I missed them inside the packaging. The cart fits in really tight spaces for my extra storage. The drawers opens and closes smoothly. I am satisfied with the functionality of this cart. I like this cabinet but I would have preferred one on wheels so even though it says it is wheeled it is not. This is exactly what I wanted when I ordered! It comes assembles already so no set up required! Very convenient! Looks just like the picture says! i guess I didn't read enough of the description and this is much smaller than I thought it was. but I will use it anyway. I will pit some of my craft stuff in it. No big deal. I love this mid-sized cart. It is perfect to store all my makeup and toiletries in, plus it fits great in a corner of my bathroom. A great buy!! Because I needed something to keep a few things on hand and I just didn't have that space. "What are the dimensions? Thanks "
Approximately 12 inches x 12 inches x 24 inches high. "Is this organizer on wheels?" "How hard is the assembly for this item?" This is extremely easy to assemble.